Sound reaches the ear usually through pressure waves in air; a remarkable structure converts this energy to electrical signals which are transmitted to the brain through the auditory nerves. The human ear is capable of impressive performance. It can detect vibratory motion so small it approaches the magnitude of the molecular motion of the air. Coupled with the nerves and brain, the ear can detect frequency differences and combinations, magnitude, and direction of sound sources. It can also analyze and correlate such signals. A brief description of the ear and its functioning follows. Figure 6.1.3 shows the anatomical division of the ear. The external human ear (called the auricle or the pinna) and the ear opening (the external auditory canal or mea-tus) are the only parts of the hearing system normally visible. They gather sound waves and conduct them to the eardrum and inner drum. They also keep debris and objects from reaching the inner ear. The working parts of the ear include the eardrum and organs which lie behind it; they are almost completely surrounded by bone and are thus protected. The sound transducer mechanism is housed in the middle ear (Figure 6.1.4). The eardrum or tympanic membrane is a thin, tough membrane, slightly oval in shape and a little less than 1 cm in mean diameter; it vibrates in response to sound waves striking it. 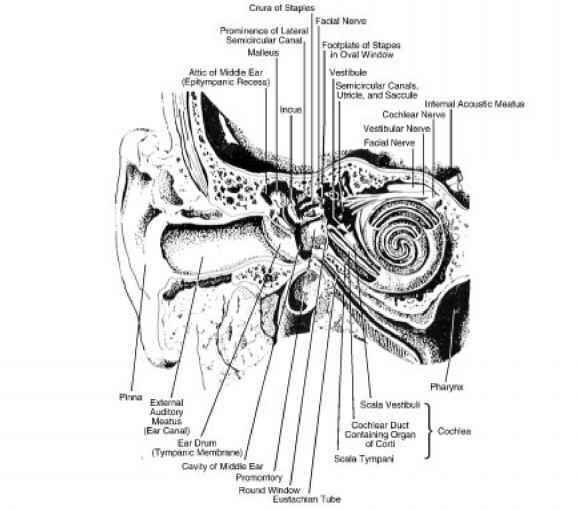 The vibratory motion is transmitted through three tiny bones, the ossicles (the malleus, the incus, and the stapes; or the hammer, anvil, and stirrup), to the cochlea; it enters the cochlea at the oval window. The ossicles are in an air-filled space called the middle ear; close to the middle ear are small muscles which act on them and on the tympanum. 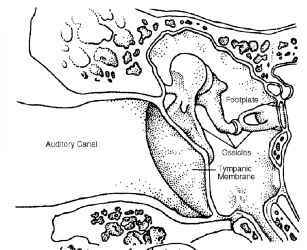 The principal function of the ossicles seems to be to achieve an impedance match between the external auditory canal and the fluid-filled cochlea. The principal function of the middle-ear muscles seems to be to control the efficiency of the middle ear by controlling tension of the eardrum and the mechanical advantage of the ossicles as a lever system. The middle ear is connected through the Eustachian tube with the nasal passages so that it can accommodate to atmospheric pressures; without this connection, changing atmospheric pressure would apply a steady force to the eardrum and prevent its free vibration. The cochlea or cochlear canal functions as a transducer; mechanical vibrations enter it; electrical impulses leave it through the auditory nerve. The cochlea is a bone shaped like a snail, coiled two and one-half times around its own axis (Figure 6.1.3). It is about 3 cm long and 3 mm in di ameter at its largest part. 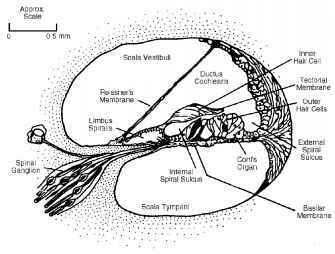 It is divided along most of its length by the cochlea partition, which is made up of the basilar membrane, Reissner's membrane, and the organ of Corti. 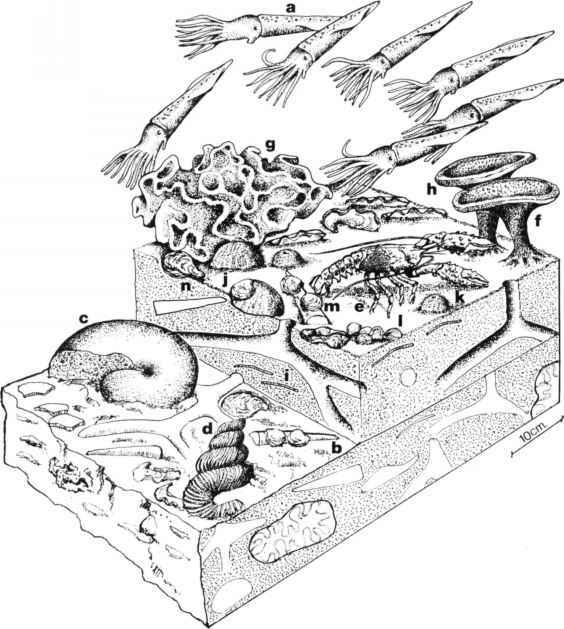 A cross section through the cochlea (Figure 6.1.5) reveals three compartments: the scala vestibuli, the scala media, and the scala tympani. The scala vestibuli and the scala tympani are connected at the apex of the cochlea. They are filled with a fluid called perilymph in which the scala media floats. The hearing organ (organ of Corti) is housed in the scala media. The scala media contains a different fluid, endolymph, which bathes the organ of Corti. The scala media is triangular in shape and is about 34 mm in length (Figure 6.1.5). Cells grow up from the basilar membrane. They have a tuft of hair at the end and are attached to the hearing nerve at the other end. A gelatinous membrane (tectoral membrane) extends over the hair cells and is attached to the limbus spiralis. The hair cells are embedded in the tectoral membrane. FIG. 6.1.5 Cross section through the cochlea. Vibration of the oval window by the stapes causes the fluids of the three scala to develop a wave-like motion. The movement of the basilar membrane and the tectoral membrane in opposite directions causes a shearing motion on the hair cells. The dragging of the hair cells sets up electrical impulses which are transmitted to the brain in the auditory nerves. The nerve endings near the oval and round windows are sensitive to high frequencies. Those near the apex of the cochlea are sensitive to low frequencies. Another structure of the inner ear is the semicircular canals, which control equilibrium and balance. Extremely high noise levels can impair one's sense of balance. The ear has some built-in protection; since it is almost entirely surrounded by bone, a considerable amount of mechanical protection is provided. The inner-ear mechanism offers some protection against loud noises. The muscles of the middle ear (the tensor tympanus and stapedius) can reduce the ear's sensitivity to frequencies below about 1000 Hz when high amplitudes are experienced; this reaction is called the aural reflex. For most people, it is an involuntary muscular reaction, taking place a short time after ex-posure—0.01 second or so. For sounds above the threshold of pain, the normal action of the ossicles is thought to change; instead of acting as a series of levers whose mechanical advantage provides increased pressure on the eardrum, they act as a unit. Neither of these protective reactions operates until the conditions are potentially damaging.